Wit is a 2001 American television movie directed by Mike Nichols. 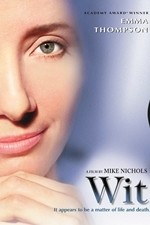 The teleplay by Nichols and Emma Thompson is based on the 1999 Pulitzer Prize winning play of the same title by Margaret Edson. The film was shown at the Berlin International Film Festival on February 9, 2001 before being broadcast by HBO on March 24. It was shown at the Edinburgh Film Festival and the Warsaw Film Festival later in the year. Critics from The A.V. Club, New York Magazine, Los Angeles Times, San Francisco Chronicle and The Wall Street Journal, among others, also highly praised the film and its performances. Nichols' direction was lauded in many reviews as well.